Our feline friends require nutrition that helps maintain lean muscles without excess calories. That’s why our grain-free chicken & cod recipe is formulated with 83% animal-based proteins and low carbohydrate ingredients, making it perfect for growing kittens to adult cats. In fact, compare our top four ingredients against the brand you’re currently feeding your pouncing little tigers. AVAILABLE IN 5 LB AND 12 LB BAGS. Check out our Top 4 ingredients. 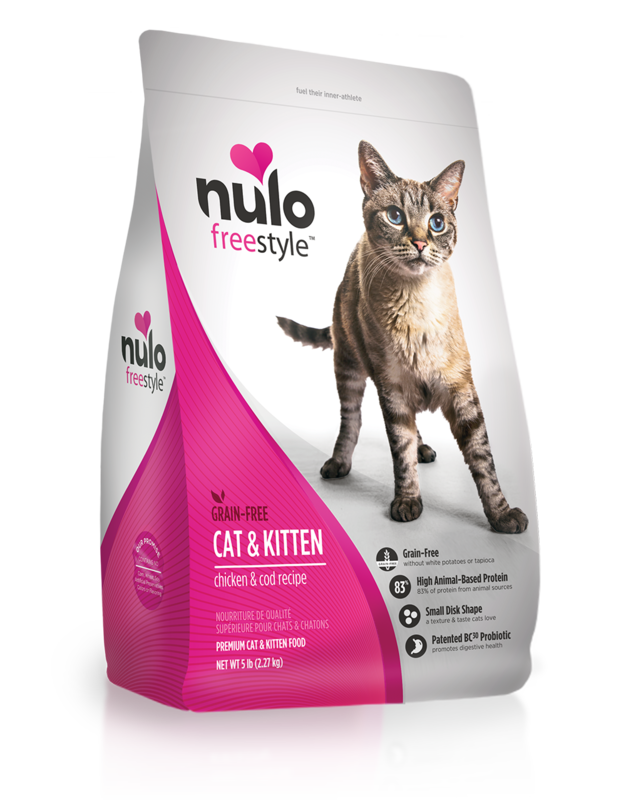 Nulo’s special poultry and fish blend provides plenty of the protein cats and kittens need to grow and maintain lean muscle mass. Nulo goes beyond the grain-free and doesn’t contain ingredients like potatoes or tapioca. Instead, Nulo uses healthy ingredients, such as whole peas and lentils to promote staying power. Dried chicory root, dried kelp and the antioxidants Vitamin C & Vitamin E promote overall health. Vitamin A and Taurine support vision and healthy heart function. FreeStyle Cat & Kitten Chicken & Cod Recipe is formulated to meet the nutritional levels established by the AAFCO Cat Food Nutrient Profiles for all lifestages.